There is an elephant in the room that no one is talking about. South Africa’s demography is as follows: 81% blacks, 9% coloureds, 8% white and 2% Indian. That totals 100. No one really disputes this demography. There have been two recent election polls by Ipsos and IRR. Both of them suggest that it is really a three-way race between the ANC, the DA and the EFF. But their allocations differ a bit. For the ANC, Ipsos indicates 61% and IRR reckons 54%. For the DA, Ipsos reckons 18% and IRR reckons 22%. And for the EFF, Ipsos recons 9% and IRR reckons 12%. But both of these poll results only total to 88%. Twelve percent is split among the other 42 parties. So it is actually hard to imagine all of these variances voting for one and the same party. The 81% of the electorate that are blacks have a menu of options to choose from. And these are eroding support for the ANC. Unless there is a genius to the ANC’s internal strife – being everything to everybody? No wonder there are contradictions – like whether the Reserve Bank will be nationalised or not and whether some SOEs may be privatised. The ANC is hard to pin down. This makes it hard to reject, and thus the “default-drive” so to speak. One of those other 42 parties is a new party for Security Guards. But in the last election in 2014, it was these un-unionised security guards and the domestic workers who were said to be represented by the EFF. Because organised labour was under the ANC umbrella. As there are 1.8m security guards, that is likely to shrink the EFF’s market share. Will security guards whose career is law and order support the EFF whose mantra has been to defy the rule law and occupy the land. Will they vote for a leader whose shoots off a machine gun from the podium? And what about union cadres – are they all “hard Leftists”? Much as SAFTU and COSATU would like you to think so, that is unlikely. In the urban setting, many are middle class and their first inclination is to protect their own gains. And what about Zulu nationalism? This is the biggest single ethnic group and its people still appear to cling to Jacob Zuma’s leopard skin skirt. These are a very proud and traditional people, whose women cannot seem to see a clash between virginity-testing and gender rights. The Zulu king is not happy with the prospect of one-size-fits-all land reform which could give families in his Trust clear title to their own land. He sees that as an affront. Are they going to swing their vote to the EFF or even to the ANC? They are more likely to swing back to the IFP or even to one of the “pro-Zuma parties”. The polls are not capturing where the hidden 12 per cent will go. They are more focused on the three front-runners. If 81% of the electorate are black and you take off this hidden 12%, it leaves 76%. So based on the two polls, only about 20% of blacks are going to swing their vote away from the ANC? That is hard to believe. If 60% of the 81% remain loyal to the ANC, it could still sink to 46% of the overall election results. To some extent, it depends on what happens in the next 6 weeks. Already in 2019 we have been introduced to Bosasa. Up to the end of 2018 it was all Guptas. The IRR polls in December and then February noted a drop of between 1 and 2 percent in ANC support. Then came Cyclone Idai knocking down pylons in Mozambique that used to deliver ten per cent of our energy mix. Suddenly load-shedding was back with a vengeance. This will cost the ANC a few more percentage points. Then came D Day at the IEC. 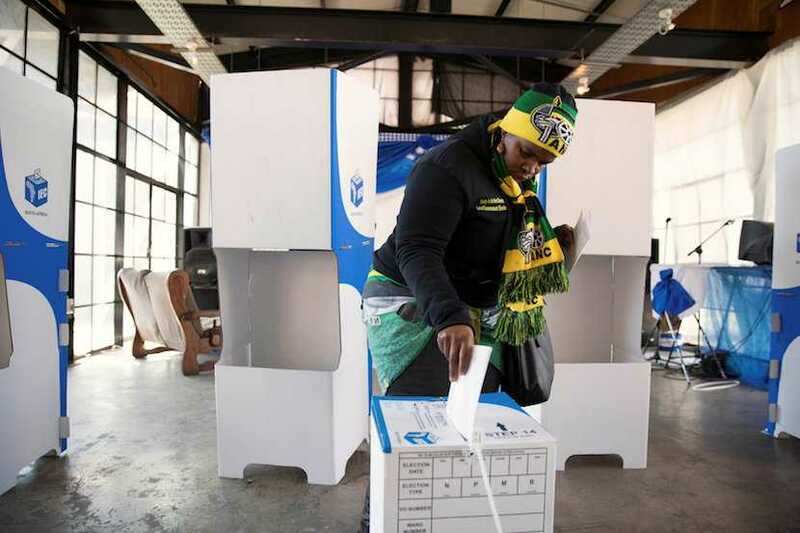 It was announced that there are now 45 parties, and the ANC lists have greatly reduced numbers of whites and all the signs of patronage and impunity that will cost them even more percentage points. What more can go wrong? What if David Mabuza loses in the High Court in Middleburg? What if he is charged with the Mpumalanga Murders like the ANC mayors in KZN facing murder raps? What if our economy is suddenly downgraded to junk status? What if the NPA finally takes on Jacob Zuma? Each and every blow costs the ANC a few more percentage points. It is slipping, slowly but surely. Ball possession is a well-known football strategy under these circumstances. The opposition parties have now declared and announced their manifestos. Into the home stretch, they need to campaign harder if they want to succeed in upsetting the apple cart. One thing is for sure – no one is secure at this point in the election campaign. It’s an open race to the finish line.